How to setup order hold codes in AX 2012 R3 CU8 and What is order hold codes in AX 2012 R3 CU8? During the sales process, there are times when a sales order must be placed on hold. When a sales order is placed on hold, an order hold code is assigned to the sales order to indicate the reason for the hold. For example, a sales order might be placed on hold because of issues with a customer payment, fraud, or to wait for review by a manager. Click Sales and marketing > Setup > Sales Orders > Order hold codes. In the Order hold codes form, click New, and in the Hold code field, enter the name of the code. In the Description field, enter a description or explanation of the code. On the General FastTab, in the Role field, select the security role that can use the hold code. 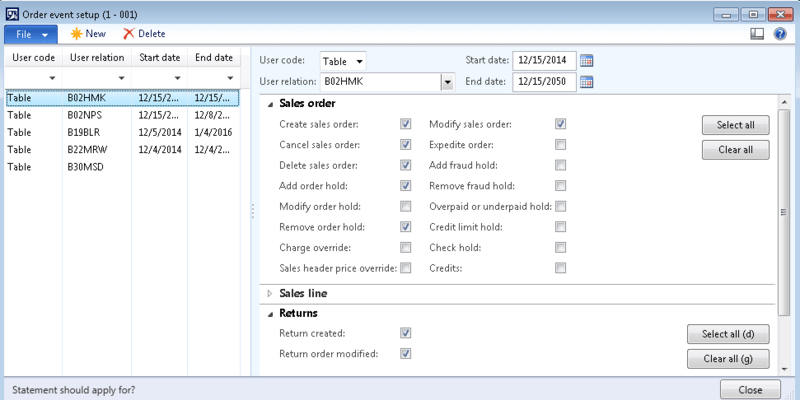 If this hold code should be automatically placed on all new sales order holds, select the Default for sales order check box. In the Hold code color field, select the color that will be applied to the hold code. If the inventory reservations on a sales order should be removed when the hold code is applied, select the Remove inventory reservations check box.